The 1936 Yaquina Bay Bridge is another of Conde McCullough's structural fantasies: an elegant engineering solution with architectural flourishes at the piers and abutments. It is a 3,223 ft (981 m) long viaduct with simple girder approach spans, five reinforced concrete deck arch spans crossing the south side of the Bay, and a 600 ft (183 m) long steel through arch with a 350 ft (107 m) steel deck arch on each side on the north side of the Bay. It is informative to compare the bridges of Conde McCullough with those of Othmar Ammann. At about the time McCullough was designing arch bridges in Oregon with Neo-Gothic elements, Ammann was in New York City, designing suspension bridges in the new Modernist style. 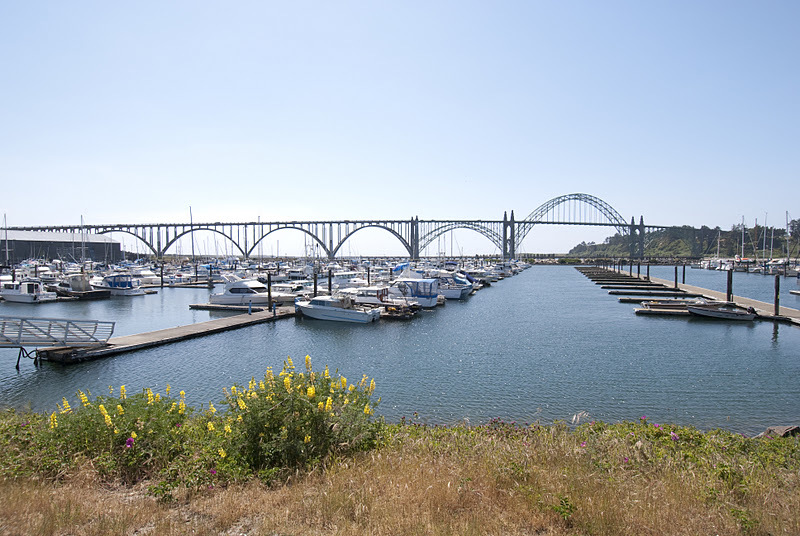 Arch Bridges: Yaquina Bay (Newport) Bridge by Mark Yashinsky is licensed under a Creative Commons Attribution-Noncommercial 3.0 United States License.